Last week, Dwell editors surveyed the scene at the annual design and interiors trade show, Maison&Objet in Paris. 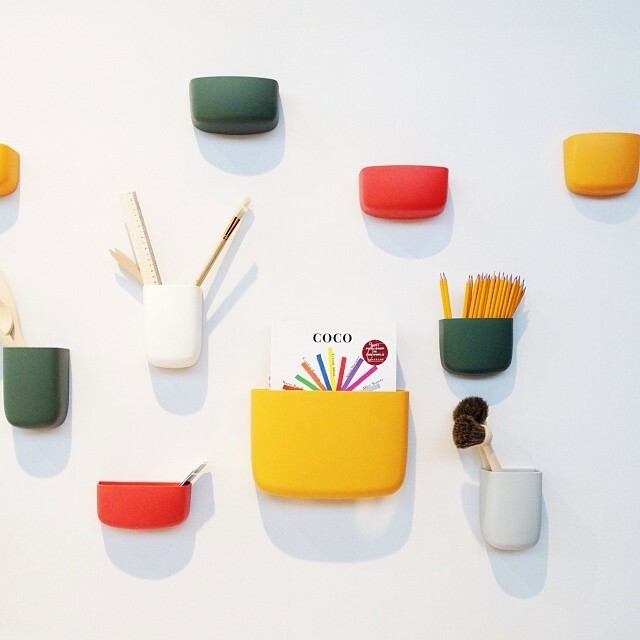 From Normann Copenhagen's brightly hued wall pockets to Sebastian Herkner's iridescent shelving units for Pulpo, we've gathered a few of the best highlights from the exhibition. In case you missed Part One, be sure to check it out here. If you're goal for the year is to get more organized, consider the brightly hued Pocket from Normann Copenhagen. An ingenious solution to wall storage: Sculptures Jeaux's hinged shelves that can be rotated open or closed. Kid chairs (in gender-neutral colors!) with Kvadrat upholstery at Soft Line. Nao Tamura blown glass installation for Wonderglass, shown in the "Landscapes" exhibition at Maison&Objet. "Vertical Emptiness" by Yasuaki Onishi. An installation made using tree branches and hot glue. Outside of the Heliotropic installation at the Maison "Elsewhere" exhibition. Sebastian Herkner's new collection (including iridescent shelving!) for German company Pulpo. Puckered upholstery: It is happening and it is everywhere. The Voltaire series of 3D-printed table lamps by Gio Tirotto and Stefano Rigolli for exnovo. New brands we love: Polit. Check out Polit's 7 Bis Repetita desk in our February 2014 issue! An architectural sculpture of the Guggenheim by the UK's Chisel & Mouse. San Francisco–based designer Tina Frey's hanging planters in blue and the just-launched "Egg Yolk" hue. Excited to see our hometown represented at Maison&Objet 2014. More lovely designs from German manufacturer Pulpo. Ole Jensen-designed kitchenware for Room Copenhagen.